I have always been fascinated with processes—how things come to be—printing, photography (old school), manufacturing (anything), baking, cooking, winemaking. And now construction; and this week, concrete. The concrete process mixes together, water, aggregate, cement, minerals, and chemicals to make a structural element. Unlike other construction materials (wood, pipe, insulation, roofing), concrete comes to the site in its raw form. For the concrete foundation of our barn/workshop we originally planned to have an Alaskan or mono slab, an economical design that calls for pouring the footings and barn floor at the same time. That turned out to be impractical due to the slope of the land, revealed only on clearing, and extreme weather considerations. The design now incorporates 5-foot frost walls, a 6-inch crushed stone base over insulation board and vapor barrier with a 4-inch pour for the floor instead of a 6-inch one. It will be solid, which is what we want when the winds howl across the mountainside at 25 mph and the mercury drops to the minus double digits. Looking from back corner of barn up driveway. Precisely positioned rebar in poured wall. Concrete construction entails precision craftsmanship. After the footings (with reinforced steel bars or rebar) were poured and allowed to cure, the concrete crew constructed the formwork, a double-walled structure of treated wood panels atop the footings. Bob placed the forms in position by crane. Other workers locked in place reinforcing whalers to create a structure strong enough to withstand the outward pressure of poured wet concrete. They snapped lots of blue chalk lines to guide the height of the pour. They placed more exactly spaced rebar. The formwork accommodates four doors—three garage and one pedestrian. Windows will be placed in the frame structure above the frost wall. Left side, garage and pedestrian doors. D tells me that the curing of concrete is not simply a drying of a wet mass but “hydration,” a chemical process that forms a microstructure to give concrete its compression strength. Suffice to say, many a PhD thesis has been written about the materials science of concrete. Edison's garage at home in West Orange, NJ. Concrete has figured prominently in the building of skyscrapers (first in 1903, Ingalls Building, Cincinnati, Ohio), New York City subways (1904), the Panama Canal (1909), and the Hoover Dam project (1936). So, with our humble barn we pay tribute to ancient and modern engineering history. It doesn’t get more concrete than that. After what seems liked interminable delays, the “barn/workshop” is underway. The order (which has been in development and refined over the course of 9 months) has been finalized with the building supply company in West Lebanon. We returned from New Jersey on Monday to be pleasantly surprised that Bob had poured the concrete for the footings and has begun making the forms for the frost walls (which are quite substantial given the winter). The electric company has us on the schedule for a site visit Thursday to determine the scope of the work, bringing electricity up the driveway to the barn first and then later to the house. Kevin the electrician stands ready. Richie is on deck to do the framing and other onsite construction. This celebration of moving forward, however, was not without some surprises. Without benefit of a logger (the one who did a good job on initial clearing has been too busy for a second go around), Dave, our excavator (with our blessing) took matters into his own hands and started bulldozing trees a week ago. Enough waiting, already, he said. His job was to clear enough land to reposition the barn in a way that allows for a simple slab on flat ground without any drainage issues. As we have quickly come to understand, flat and central New Hampshire usually are not uttered in the same sentence. Some time ago we had roughly determined the home/barn site. We had a surveyor create a topographic map with a 2-foot lines of elevation. After the initial clearing and excavation, the laser leveler told us that the slope was a little different than what we originally expected. The ground slope is perfect front to back (8 feet) for a walkout basement but also slopes considerably on the one side creating a not insurmountable access challenge for the entry door. This surprise is also an opportunity, however. The more aggressive slope means a more dramatic solution; perhaps a combination of graded path and a few more steps to the door, as well as a retaining wall using rocks sourced from the excavation. And, it also means there can be a different step-down in the foundation on the side and a window in the basement that hadn’t been possible before. On our recent trip back to New Jersey we couldn’t help but note the overall flatness of the land east of Princeton—they don’t call a nearby town Plainsboro for nothing—and how relatively easy it would be to position 20 houses in a development. We also recalled the great expense D incurred when he had to hire a civil engineering firm to survey for a small addition—in order to meet Draconian local building codes. In New Hampshire, we could have hired a firm to survey the site down to 1-foot elevations, albeit at great expense. Instead, we chose to eyeball it—with the help of Dave’s expertise and 30 years of experience on a bulldozer—and deal creatively with our discoveries. Log cutter (above and below). A behemoth of a machine. P.S. Just as I complete writing this blog, word comes that logger Steve is setting up onsite with his skidder and log cutter, ready to continue the clearing. So we will have a full house on the mountain—logger, excavator, utility company representative, concrete truck, and various workers plus Doug and me (and the bears and moose). Confession: I have allowed myself get annoyed over all the recent waiting (not idle waiting but active waiting, as in doing everything needed and depending on someone else to do something) for the next phase of excavation and concrete for “the barn” construction to proceed. Mud season has departed (mostly) and all the big guys who move logs are busy. So we wait to move up the list so we can get some space cleared that wasn’t first envisioned in the first go-around of the logging. (It’s pretty hard to discern subtle differences in gradients when you are in thick forest.) It took me just a little rearrangement of my attitude to remember I am waiting in such a beautiful place. Blame it on the paint fumes and too much heavy lifting of boxes. View looking north to Mount Cardigan. All photos by author. One of many small islands. At Grafton Pond, no gas-powered boats are allowed. People (and dogs) in canoes and kayaks, and on the occasional paddle board quickly disperse from the state-run boat launch and modest parking area to begin exploring the numerous bays and uninhabited islands. We brought a lunch and after an hour found a large isolated rock on which to perch and enjoy a break from paddling. The attraction of Grafton Pond is that it is so wild and so pristine. Only a few houses are visible, and those are near the put-in. 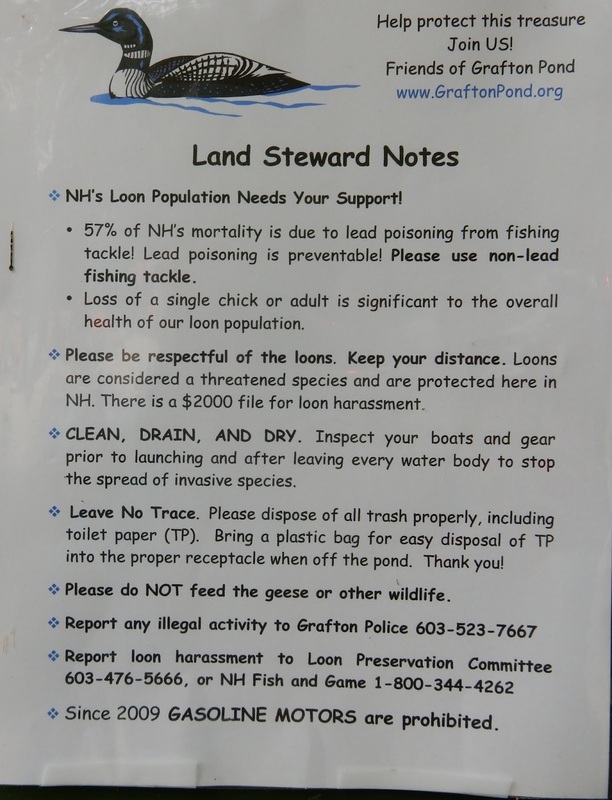 The seven miles of shoreline and surrounding land (owned by Grafton Pond Land Trust) are under the stewardship of the Society for the Protection of New Hampshire Forests and Friends of Grafton Pond. 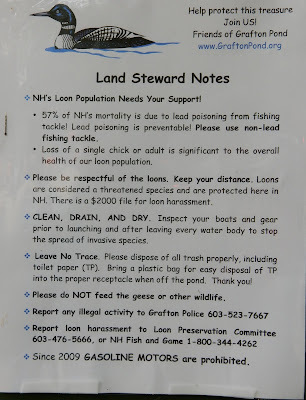 Visitors to Grafton Pond take seriously the prohibitions and don’t leave behind as much as a gum wrapper. In an isolated cove we spied a large snapping turtle were able to follow quietly for a bit. Kingfishers flew back and forth across the water. We spotted a loon family (one of several who make the pond their nesting home). The female had two chicks so close to her they were almost imperceptible from the required viewing distance of 300 feet. (I took a discrete picture but would have needed more serious camera power to get anything better.) The male was nearby and made some protective yodels. For two hours on what must have been the busiest leisure weekend (July 4th), we enjoyed what we came to New Hampshire for—nature, mother to all.